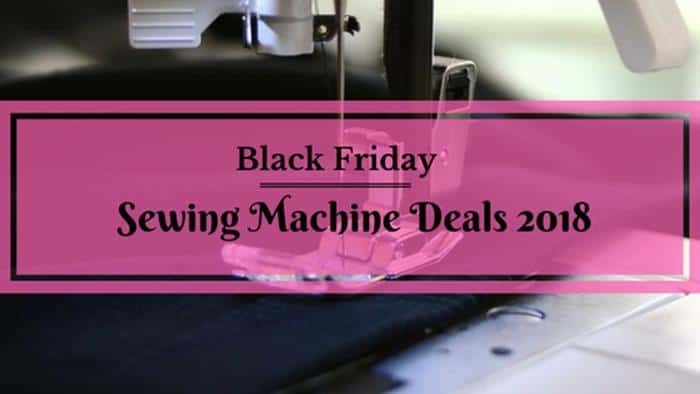 If you have been waiting for Black Friday sewing machine deals of 2018? It's over now. Come back in 2019. Updated: November 28, 2018. Check the today's deals at Amazon here. I also have tips for knowing how to navigate to the best Black Friday deals at Walmart and Amazon. Bookmark this page and often revisit during the holiday season of 2019. I'll be updating this page with all the latest sewing related deals during the holidays as soon as they came out. You'll find all the best offers in one place. I believe savings should be hassle-free. It's the goal of this page to help you get the significant deals without lifting a finger. We’ve reviewed all of these machines and have found them to be of high quality. They’re great whether you’re just starting out or if you’re an experienced sewist. If you can find any of the following sewing machines on sale, grab it. You will be thrilled. And grab another machine to give as a gift. Also, these were top sellers during last year’s Black Friday, and that means there’s a good chance that they’ll be on sale again. Check back here regularly as I will be updating it with more information on the deals. If you’re shopping the Walmart Black Friday sewing machine deals, you need to know…. You’re better off shopping online. The stores get so crazy, and it seems like people lose all their senses as they’re competing for bargains. You may pay a few dollars more online, but it’s worth it to know that you’re safe. And you can enjoy a lovely beverage while doing your shopping. Get on their Early Access mailing list is one of the best things you can do. In the past, they didn’t have all of their in-store deals available online. So if you’re on the mailing list, you’ll be able to see if they have the sewing machine you’re looking for. You also want to look for when their online start time is. Last year, it started at 11 pm the day before. You also want to double check what time zone it is. Last year, the time listed was for the Central Time zone. The best way to find the deals on Amazon is to be prepared. Last year, they ran what they called their "Pre-Black Friday Deals" and “Black Friday sale” for many days. It’s not known if they’ll repeat that in 2018. To make it even more complicated, they had special deals only available via Alexa. You had to ask “Alexa, what are your deals.” The downside is not everyone has an Alexa. You will improve your chances of better deals if you are a part of Amazon Prime. You can sign up here. Be careful you’re buying new and not a returned in a box. You want to be sure you’re not buying a refurbished or returned sewing machine. Amazon has a page for their Black Friday deals. You should set aside some time to review all the upcoming deals. Figure out what ones you want, and then set a reminder or alert on your phone or computer. Don’t want to spend the time? That’s OK. There are some apps for that. You’ll want to download the Amazon, and Prime Now apps and set up the Watch a Deal. And if you want something even easier, just come back here. I will be updating it as soon as I have more information for you. It's over now! Brother has been in the business for a very long time. They have excellent customer support that will spend time ensuring that you get your questions answered. Historically, Brother puts a few of its machines on deep discount. We won’t know which sewing machine deals they will choose until closer to November. Here are some of the top sewing machines which were on discount during Black Friday last year. We rated this as the best machine to buy if you’re starting out. It’s super easy to learn to use. And it’s sturdy enough to handle projects as your sewing skills advance. It’s a computerized machine allowing you to choose from 60 stitches. It also has super easy threading, bobbin winding, and an automatic needle threader. Its large table sewing area makes it easy to work on large projects. And it has variable sewing speed control. It’s a great beginner machine that will grow with you. This is an embroidery machine rather than a sewing machine. You can create an embroidered design using their 5x7 inch hoop. There are 136 built-in designs. You can also import your own through the USB port. And Brother sells cartridges of designs that you can import using a built-in card reader. You can edit your designs using the on-screen display. And you can adjust the sewing speed to match the material you’re sewing on. Black Friday deal for 2017 on Brother se400 was outstanding. This year we can expect the same. Want the best of both worlds? Look for the Brother SE400. It allows you to sew and embroider. Its embroidery hoop is 4x4 inches. And there are 67 built-in stitches for sewing and 70 integrated designs for embroidery. Singer makes some fantastic machines that can handle a variety of projects. They have an excellent customer support team, and regularly post instructional videos to YouTube. These three sewing machines all have heavy duty metal frames. This ensures the machine remains still for skip-free sewing. Singer allows vendors to discount a wide variety of their sewing machines. We won’t know exactly which models until closer to Black Friday. So check back here regularly as I will be updating this post. We saw the huge price drop on Singer 9960 on Black Friday. The 9960 Quantum Stylist is a computerized sewing machine with 600 built-in stitches. It also has one-touch thread cutting and an automatic needle threader. There is an extension table which can be very useful for stabilizing large projects like quilts. Singer 4411 was on sale during Black Friday promotion last year and year before that. I'll update here as soon as this deal comes out. So you can take advantage of it. The Singer 4411 Heavy Duty Sewing Machine can handle some of the craziest sewing projects you throw at it. Need to sew through layers for a cape? This can handle it. Need to sew through a canvas for a market bag? This can handle it. It’s a wonderful machine for people who are wanting to sew using basic stitches. It’s easy to set up and use. And because it’s heavy duty, you will get great results. Last year we saw this machine sold for less than it's original price, and that was a killer deal. Be sure to revisit this site during Black Friday I'll be updating here about it during the holiday season. It has started now. The Singer 4423 is the next level up from the Singer 4411. The 4411 only has 11 stitches and a 4-step automatic buttonholer. The 4423 has 23 built-in stitches, an automatic needle threader, and a 1-step fully automatic buttonholer. Last year, people saved big on this 23 stitch sewing machine. I'll update here if it goes on sale again. Adjustable stitch length, width, and tension with extra high presser foot lift allow you to work with a wide variety of fabrics. They use a special jam-proof magnetic rotary hook so you can keep sewing without having to stop and clean out the bobbin area. Plus, there’s also a 7-piece feed dog to allow for more precise fabric control. Janome deals are a little more elusive. They do have a few machines on deep discount. And I’ll be watching for what they are so I can update this blog post with the discounts. If it goes on sale, the discount for the Janome 8077 sewing machine with 30 built-in stitches will be updated here. You can also control the Janome 8077 via the foot control pedal or through a start/stop button for more precise control. If you’re looking for a well-built sewing machine, look for the Janome Magnolia 7318. It has 18 built-in stitches to choose from. This sewing machine is suitable for a variety of fabrics which is excellent when you’re first starting out and not sure what you enjoy sewing yet. If you’re making buttonholes, this is a 4-step buttonholer. It's an amazing machine for beginners. Like sewing machines, sergers could also go for the discount this year. I'll update about all the discounts regarding the Brother, Singer and Janome sergers here. Here are the quilting machine deals. Update: Quilting deals have started to pop up again this year. Singer 7469Q confidence quilter is a great option for quilters and comes with the extension table, quilting foot, walking foot and drop feed dog capability. It's a high-speed straight stitch machine and offers lots of space to handle big quilting projects. All of these sewing machines are great for beginners. They sew consistently well and are fairly jam proof. You will get well-formed stitches with all of these machines. And check back with this post regularly the closer we get to the holiday season. I will be updating it with more deals. Looking for only Cyber Monday sewing machine deals, here is the page for that.